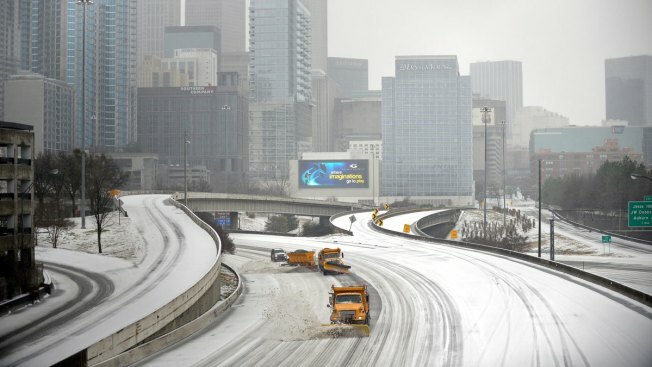 This Feb. 12, 2014, file photo shows snow plows clear Interstate 75/85 on the downtown Atlanta connector while transportation and business grinds to a halt during a winter storm. 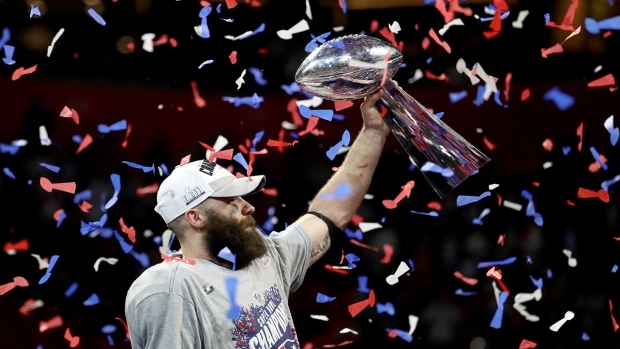 Sunday's Super Bowl will be played in downtown Atlanta in Mercedes-Benz Stadium, which has a roof. The roof will be open if weather permits, officials have said. There's a 40 percent chance of showers Sunday, but highs will be near 58 degrees (14 Celsius). That's slightly warmer than average for Feb. 3 in Atlanta, climate records show. But forecasters say the more immediate threat is Tuesday, when roads could be treacherous. And forecasters were uncertain how widespread the snowfall will be. "Some uncertainty continues regarding amounts of snow accumulations and how far south and east the threat may extend," the weather service said in a Monday update on the approaching storm.